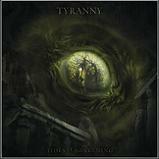 Tyranny are an evasive duo from Finland who are involved in many extreme doom projects. Their previous venture, Wormphlegm, only presented the world with one demo - one which had been bestowed a most grisly and lengthy title, albeit one well suited to the torturous funeral drone contained within. That was a testament to the art of inflicting pain; this album, Tides of Awakening, is a partner piece instructing in the discipline of appreciating one's own suffering. The proceedings begin with a crescendo of strings and feedback, building to the moment where the vocals sweep under the bass like a foul exhalation, obscuring the graveyard's ground with billowing fog and leaving you floating in a darkened void. Even so, hope shines through in places; not every chord is immediately forced to be minor which gives the guitar an opportunity to trace enchanting melodies, but this is bittersweet as the clouds of this atmospheric storm obscure the moon every time you catch a glint of its light. This description may sound somewhat gothic (and overindulgent), but this is not music for pallid vampires in flowing nightgowns who are simply tempting themselves with a touch of the occult. No, let them be satisfied with My Dying Bride; this is for the shades and wraiths that have accepted their fates, the ones who haunt the places they least wish to be. Over all, it is music for those of us who have come to terms with the fact that there is no escaping this life but choose to cultivate our anger at being born. Yes, this is overindulgent too. Although this album is drenched with moans, reverberations and lush symphonics to the point where it runs like liquid, it has been divided into five tracks. The next, "Sonorous Howl from Beyond the Stars", features a more prominent guitar line which is repeated to the point where it could induce narcosis. I realise now that I haven't been able to fathom the merest snippet of lyrical poetry since I began listening, but I trust the sincerity of the band and anyway the dour, leaden voice emanating from my headphones conveys all the emotion and meaning I need. Yes, this too is overindulgent. The third track, entitled "Upon the War-Torn Shape of Cold Earth", has much the same feel as its predecessor but does feature a little more activity behind the kit and what I would describe as martial chord progressions. Also, it has been expanded to an ambitious 17 minutes. This dirge contains no easy resting points, choosing instead to agitate you to the point of dissolving your resistance to the music, eventually immersing you in darkness. This is an effect I would liken to Burzum's deceptive yet magnificent opus, "Rundgang um die Transzendentale Säule der Singularität", in that the music repeats ad nauseam but each iteration affects your reaction to the piece. Again, this phenomenon will only occur if you are assured of the performer's conviction, and again, this is conscious indulgence. The fourth track continues at a similarly funereal pace, presenting you with a pulse every three seconds and beat of the snare every six, exactly enough time to for the previous to have finished echoing around the barrow. The final composition, "Entreaties to Primeval Chaos", features howling, grim chanting and bombastic percussion, akin to a tribal sacrifice under the ground. At around four minutes, water begins to pour into the barrow and eventually the lungs of the monks are too waterlogged for the chanting to continue. Perhaps their ceremony failed or was misguided, or perhaps instead their corpses are to be used in the next cycle of this midnight ritual. This too is an indulgence on my part, a merest speculation influenced by a mosaic of cascading sounds entwined with all the various, esoteric (Esoteric!) thoughts I have collected during the day. Hear this; if you have read this review and raised your eyebrow at my fancy, or if you are not the type to indulge your subconcious or to lament freely, then return to your ironic, standoffish music and appreciate it from a safe distance. Discuss the banal lyrics, perhaps, or else exult over the brief visceral thrill you received from a particular short passage while acknowledging that your reaction will be dulled upon your next encounter with it. Then, forget about that music on your way to bed and dream of material gains, of your preprogrammed goals and prejudices, or perhaps of doing the same thing tomorrow. ON THE OTHER HAND, if you find music to be the most important thing in your life, this is your album. If funeral doom or black metal has touched your soul and found it tarnished but more alive than most, seek this out. Do not be discouraged by responsibilities to the world you think you inhabit; when this music is playing, your material existence is the illusion. Let yourself float freely in a world where you no longer need to justify yourself to yourself. This is music of which you are already an element. Don't deny yourself this indulgence.